OMG how sad is that: 2nd last in the run. Stone last in the 1km swim (although I maintain that Sofie and I did two extra laps because we got our counting muddled up… not that it would change my result much). I can only hope that my cycling skills will do me proud on Sunday. I had a terrible run on Tuesday. Ate way too much at the office, too close to our running time, and struggled up the hill with a bad stitch. Thankfully Sofie became my guardian angel and stuck by me the WHOLE TIME (although I’m sure she could have gone a lot faster), and even did some reverse-jogging while encouraging me to breathe deeply to get rid of the stitch. Yeay for Sofie!!! On the upside, I beat my previous PB by 5 whole damn minutes! Not too shabby for a slowpoke fattie! On a sad note, I think it’s time to retire my running shoes. They’re high-mileage shoes and they’ve logged just short of 600km, but on Tuesday I had hectic pain my feet, which I’ve never had before. Crap… one more thing to buy. I was very nervous about the swim and dreaded being the last one out of the pool. In hindsight I should have done a couple of warm-up laps to get into the swing of things, because when Steve set us off I went into a massive panic and couldn’t get my breathing sorted, couldn’t put my face in the water, and I started developing a bit of a cramp in my thigh. Not a good start for 40 laps. I also had to stop mid-way because my goggles started leaking and misting, and not being able to see properly was quite traumatic. put 20 elastic bands around my wrist and remove them each time I complete two laps. swim two or three laps beforehand to get rid of the initial panic so that I can be more relaxed when we start. Slow Lane Three (from left): Megan, Sofie and I. 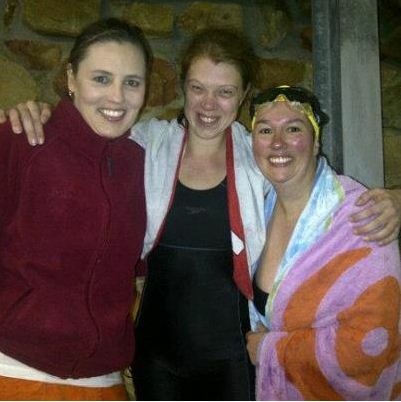 Although I think Megan has just graduated out of the slow lane, thanks to her super impressive performance in the swim. Well done Megan! You did the slow lane proud! Now, cycling is the only thing I’ve got going for me right now, so I’m amped to make an impression, restore my reputation and give Steve one thing to not worry about. Ok, so my first time trial (cycle excluded) wasn’t that impressive, but the way I see it, I have LOADS of room for improvement. I’m really happy for the fast guys in the front and they’re seriously impressive, but how much faster can they go? Me? I have enough room to come from behind and totally blow this thing apart.